When 10 young playwrights, nine male and a female, converged on the Agip Recital Hall, MUSON Centre, Lagos, it was clear a new awakening was afoot for Nigerian theatre. 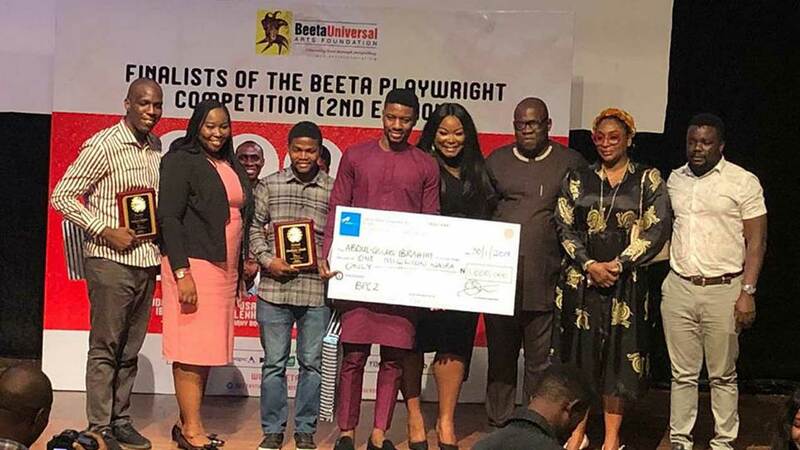 It was the grand finale of actress Bikiya Graham-Douglas-led Beeta Universal Arts Foundation’s (BUAF) second Beeta Playwright Competition (BPC). Ibrahim also said nothing gives him more satisfaction than tell interesting stories to entertain people from which they could learn a thing or two to add value to their lives. Jagagba, he said, tells such interesting and entertaining story, adding that the story is from his maternal root. Ibrahim is of Yoruba heritage. And so, is he a feminist, for him to have written a play that defends women’s rights to equality in a largely patriarchal society?“No, not really,” he hesitated, “but you can say that!”While social media is a distraction for many young men and women, Ibrahim took inspiration from social media conversations in all the platforms and used them to craft his award-winning play, Jagagba. As he said, “you just have to find a balance, know what you want,” and the result is a star prize in a keen contest, where he smiled home with N1 million plus an opportunity to see his play staged, with a book publication deal in the bargain.The contest had such jury members as theatre director, Kenneth Uphopho, veteran actress, Ego Boyo, theatre producer and writer, Ayo Jaiyesinmi, publisher, Ibiso Graham-Douglas, and led by award-winning playwright and jury chairman, Professor Ahmed Yerima, who was, however, absent during the award. And then she made the revelation that instead of just working with one playwright as she did in the last season, her foundation will work with the 10 playwrights to deepen the processes. She also commended Union Bank Plc for believing in her dream and coming to give financial assistance. WAPIC Insurance Plc also joined the sponsorship team this year to help boost the contest. Other supporters include NIMASA, Terra Kulture, Olajide & Oyewole LLP, and British Council. All the contestants expressed excitement at coming thus far in the contest and the opportunity it gave them to express themselves. But Kaduna-based Shehu Zock-Sock, author of Tick Tock More Talk, said he was jealous of Lagos for the many opportunities it has for creative, which he said were sadly absent in his home base.BUAF also gave recognition awards to certain individuals and institutions for supporting the arts and culture sector. Mr. Theo Lawson of Freedom Park, Union Bank Plc, and Lagos State government were recognised for supporting the sector.